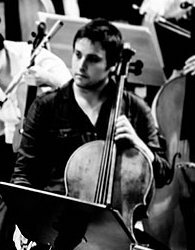 Professional cellist, freelance player with orchestras in the UK and Switzerland (including Bournemouth Symphony Orchestra, Scottish Opera, Gstaad Festival Orchestra), cellist with Aurea Quartet (**Web Address Removed**). I currently teach for **Removed By Admin** alongside private teaching. Previously I have taught at the Glasgow City Halls Music School, and participated in outreach and education work in schools all over Scotland (Dumfries and Galloway, Fife, Central Belt, Fort William, Orkney). I was lucky to study with some of the world's most highly-respected teachers, and have a lot of information to pass on. I enjoy helping students develop both as musicians, and technically as instrumentalists, which comes from my own experience of completely re-evaluating all aspects of my playing in my early/mid-20s. I believe that anyone can learn a musical instrument, and that it benefits so many areas of our lives. I'm experienced in helping players of many different ages, abilities and ambitions!